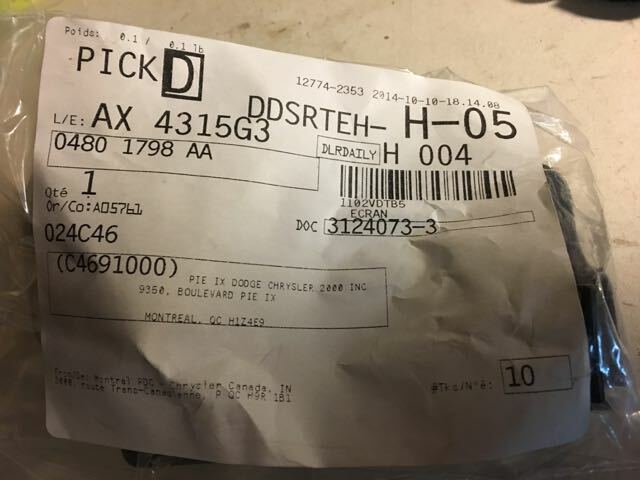 The price for a replacement wheel speed sensor cable was about $50 CAD at local parts store. 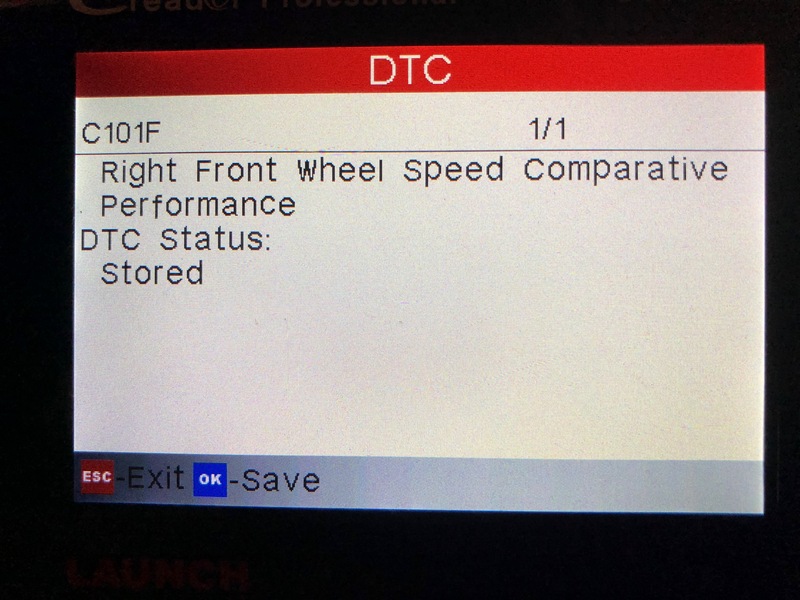 Unit Bearings were priced starting around $85 CAD including wheel speed sensor. 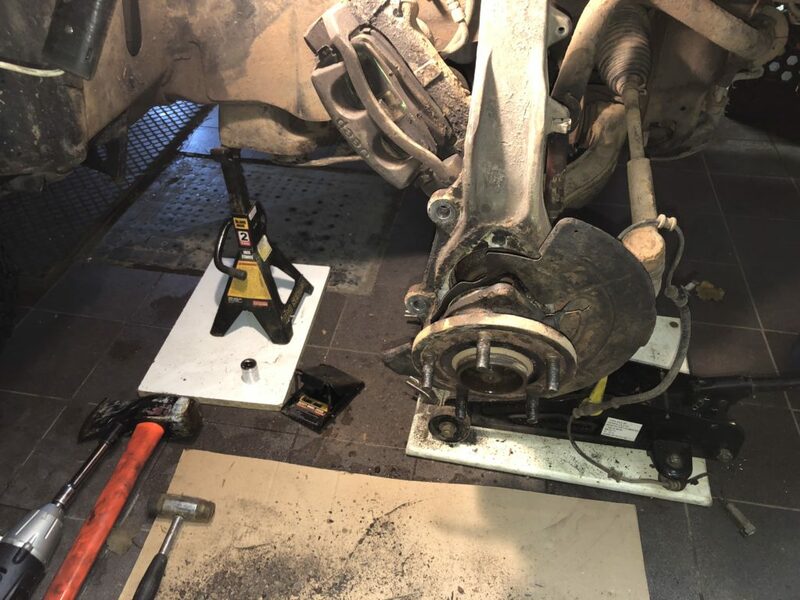 Since the Jeep and current bearings have about 185’000 kms and this Jeep is built for Overlanding and long term use, the decision was made to change the entire Unit Bearing. Since we were doing one side the decision was made to change both. Although a big believer in not fixing “what aint broke”, we are looking to put on 15-40’000 kms on our next trip depending on various life circumstances. Needing to change a Unit bearing on the road is not high on the bucket list of “want to do” road trip tasks, so both were swapped out. Since the WK was now virtually inoperable, I think it may have driven normally with the traction control turned off, but I can not remember for certain now, a new Unit Bearing was sourced locally for ~$200 CAD. Also needed was a 36 mm socket. N.B. 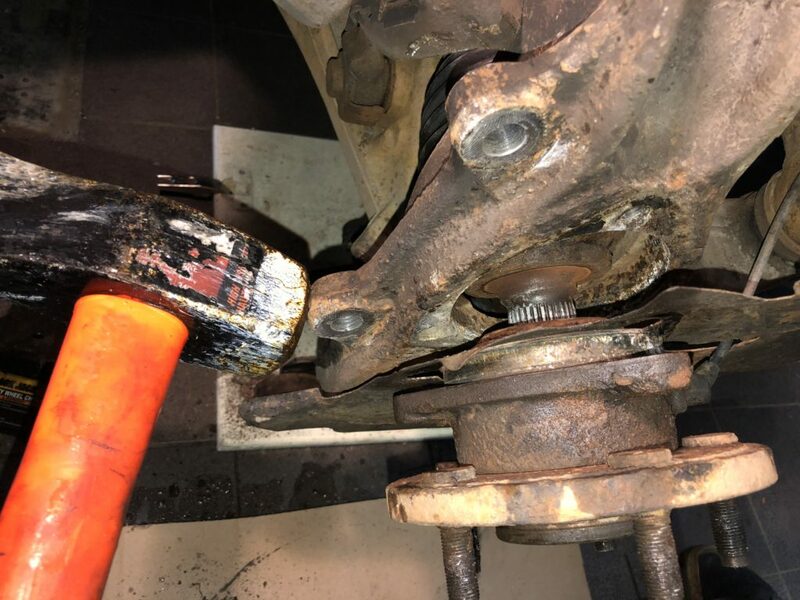 Although a normal depth socket worked fine for stock Mopar CV axle nut, the driver’s side axle had been replaced with a JBA 4xguard axle shaft at around 105’000 kms, The amount of threaded axle rod protruding on that side was more than enough to make it very difficult to get the socket to grip on the 36 mm locking nut that hold the axle into the unit bearing. 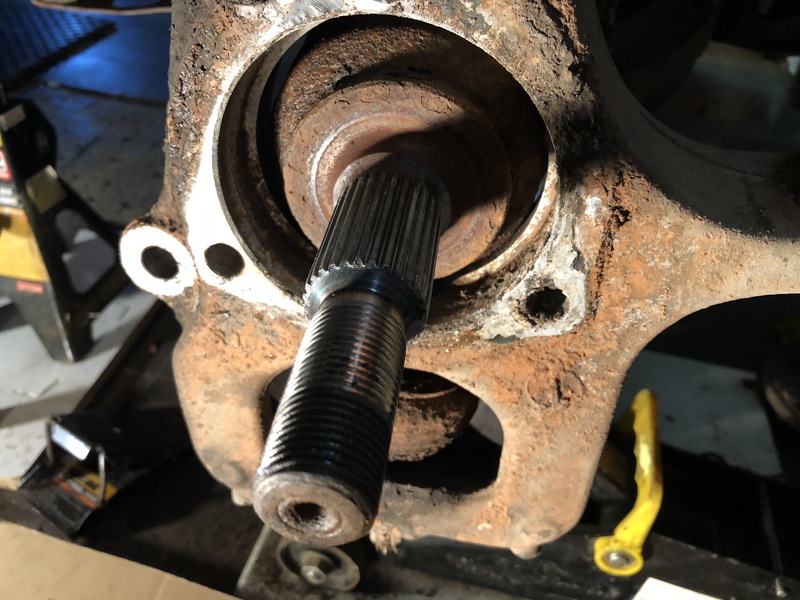 We actually used a mini-grinder to take a few mm off of the threaded end of the shaft and then clean it up so it would rethread with a new nut. 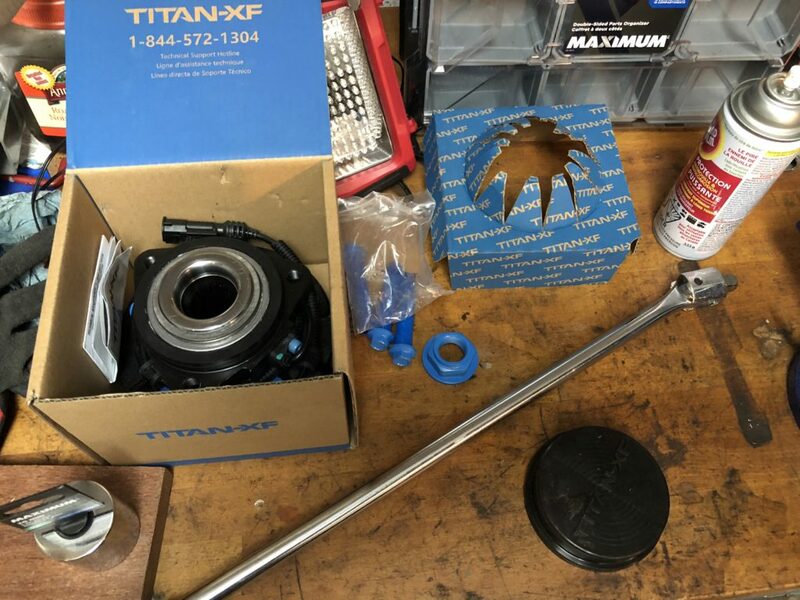 Also note, theTitan-XF bearing comes with nice coated bolts and a locking nut, but the 4xGuard axle has a finer thread than the stock and Mevotech threads, so we were unable to use the coated Mevotech nut. 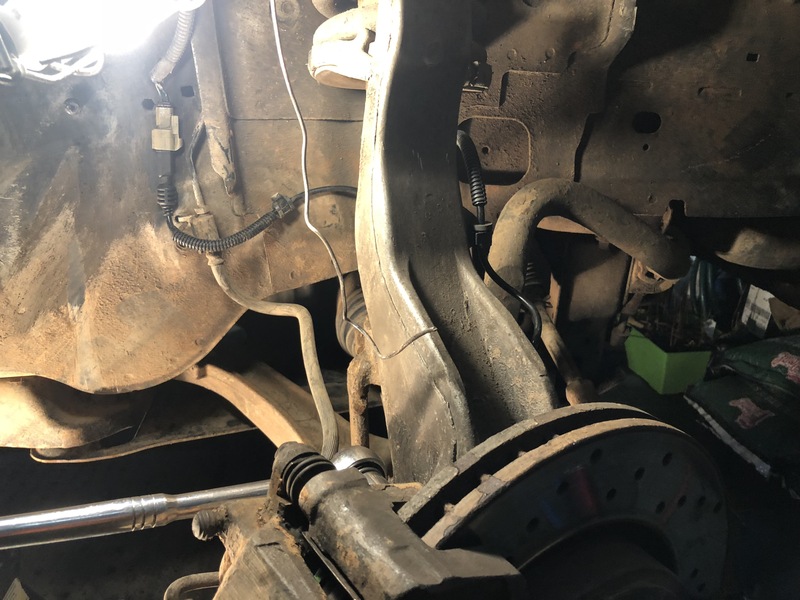 So to begin jacking the Jeep, jack stands under the chassis and frame, and then a hydraulic jack under the lower control arm to be able to raise and lower the wheel hub and steering knuckle as needed. The 36 mm nut is more easily removed with the tire on and weight of vehicle on the tire. The AEV Savegre wheels just allowed the 36 mm socket to fit through the center hole to remove the axle nut. 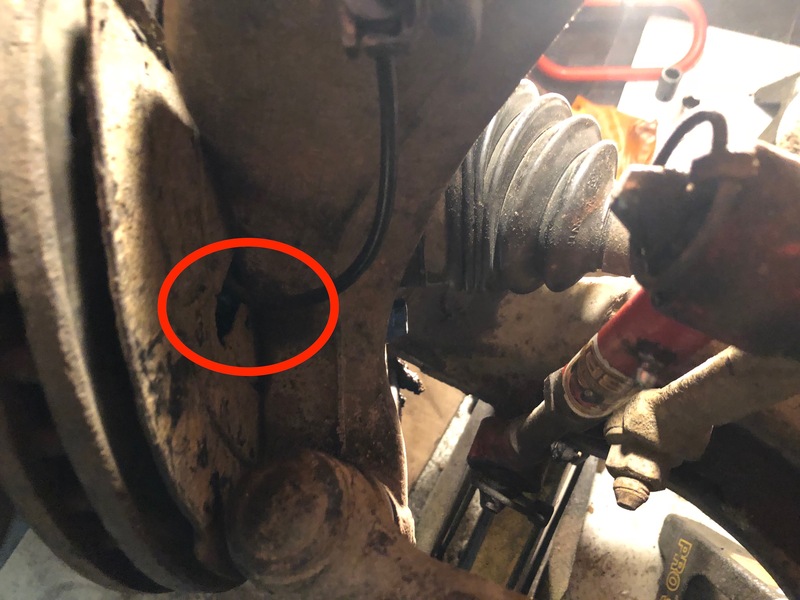 After that the calliper bracket was removed by removing the two bolts holding it to the steering knuckle and then hung out of the way with a chord or wire so there is no strain on the brake fluid hose. In the photo below you can see the wire already hanging secured above ready to accept the heavy calliper and bracket. 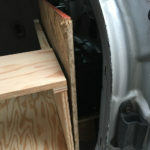 Note there is a second safety Jack stand on the Unibody frame rail to the left, and the tire is also under there in case the vehicle shifts and were to fall. Safety First. 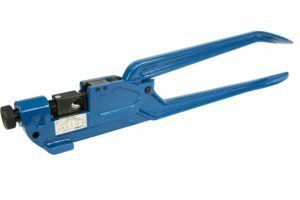 A wire coat hanger is used to hold the brake calliper up by snaking one end through the calliper mounting bolt hole, and wrapping the other around the UCA, or the a spring coil. 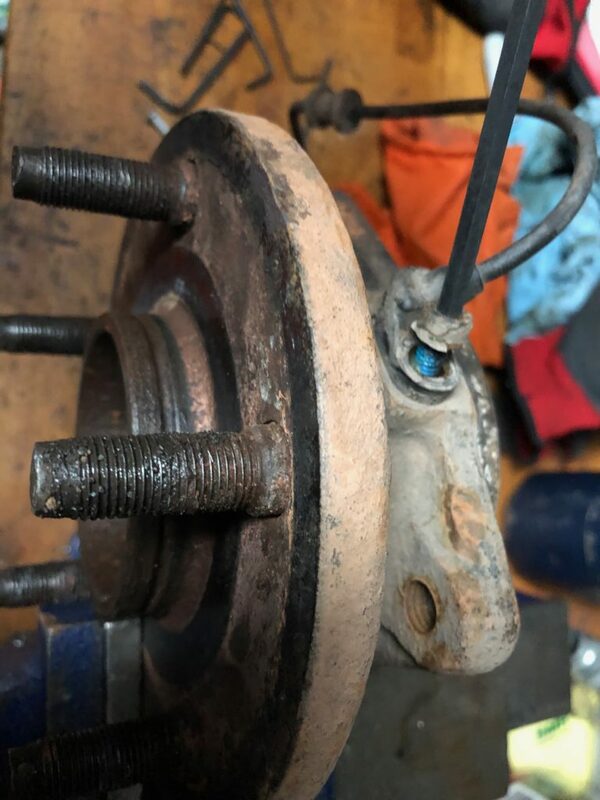 2007 Jeep Grand Cherokee Wheel Bearing Removal with tap hammer after three bolts removed. 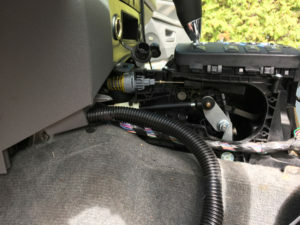 It is a good idea to disconnect the wheel speed sensor from the connector on the inside of the wheel well, and disconnect the wire form the grommet clips that hold it in place. You should be able to reuse all of these if you open them carefully with a small screwdriver or whatever works best for you. 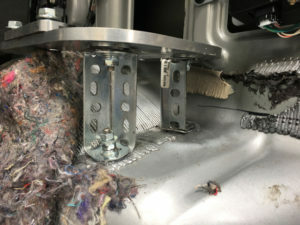 You do not want your wheel speed sensor wire floating around loose with the chance to be snagged and ripped free by your rotating tire. While here this is an easy time to check other components and perform other maintenance. 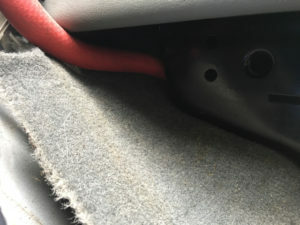 I knew I had a leaking CV boot, so I had purchased a Moog Outer CV boot with grease and clips. Since the axle nut needs to be taken off it was the ideal time to perform this task. That is another story, but suffice it to say the grease in the CV bearing was extremely dry and it definitely benefitted from repacking and a new boot. I also checked my lower ball joints which as suspended had a “little play”. I had replaced these with Moog Problem Solvers about 80’000 kms ago. Moog Problem Solvers after 80’000 kms. These have since been replaced by Mevotech TTX on both sides. 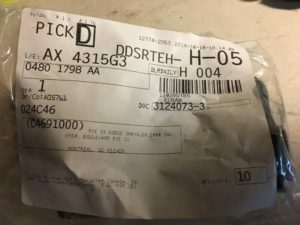 The original Moog were under warranty, but with shipping, labor etc the warranty does not mean much. 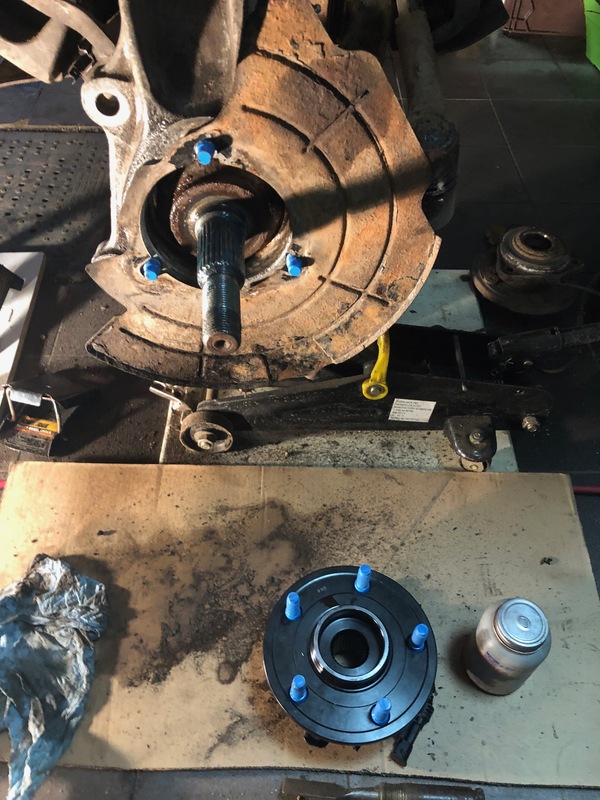 Moving right along, with the bearing out the knuckle and various parts were cleaned up with brake cleaner, wire brush, wire wheel scraper etc. 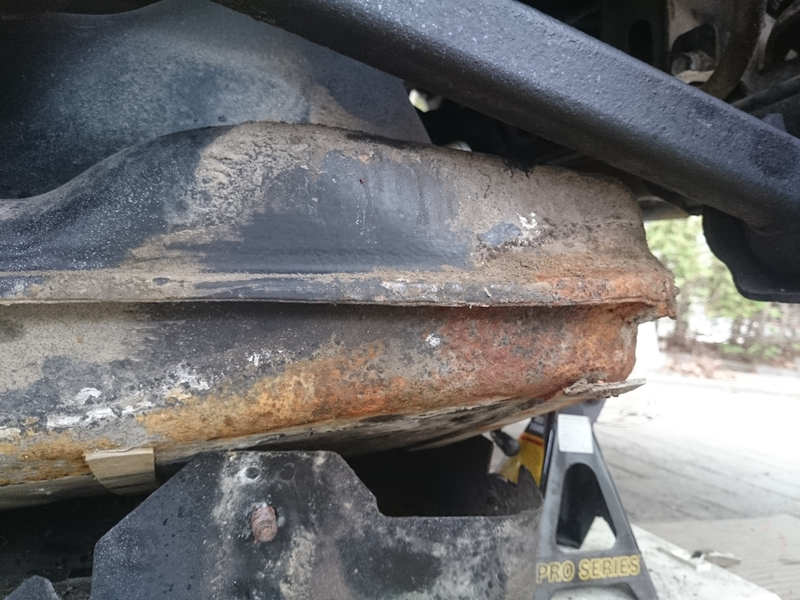 Since no Lower Ball joint had been procured at this point, the wheel would have to come off again at a later date. The bolts need to be pushed through the back of the knuckle first and they hold the dust plate, brake backing plate in place until you align the bearing assembly and get the bolts to start to thread. At this stage it is important to pay attention to things like which way the backing plate should face, and how it is oriented, as well as how you will orient the wire for the wheel speed sensor on the unit bearing. (note the blue anti corrosion coating on the Mevotech Titan-XF bolts and axle nut) make sure your sensor wire is oriented properly. Below is wrong. 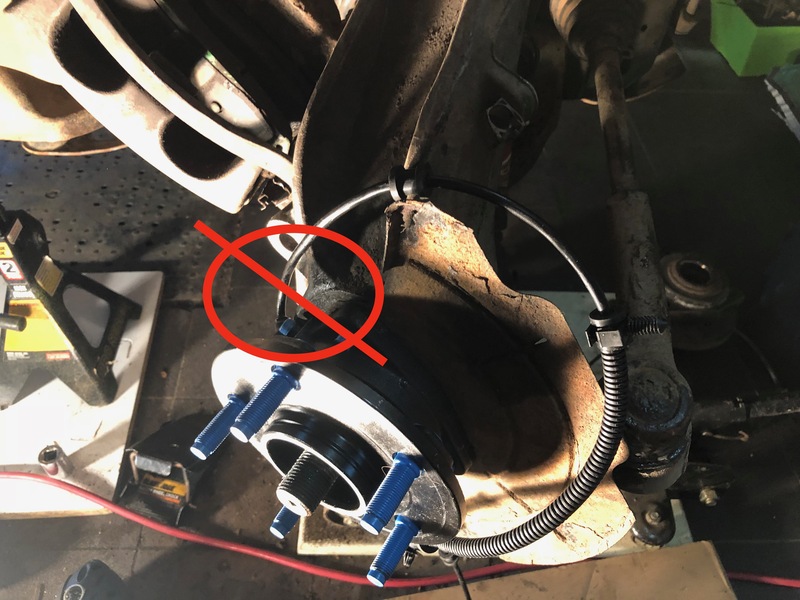 In this Nine O’clock position the sensor wire sits in the middle of the brake calliper and the wire does not go through the hole in the backing plate located at Two O’clock. When mounting the unit bearing this is incorrect orientation for the sensor wire. 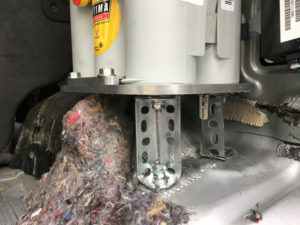 Here is a photo of the wire and backing plate as it should be with properly oriented unit bearing mounted and tightened up. This photo is taken from the front of the Jeep just inside the wheel looking to the back. 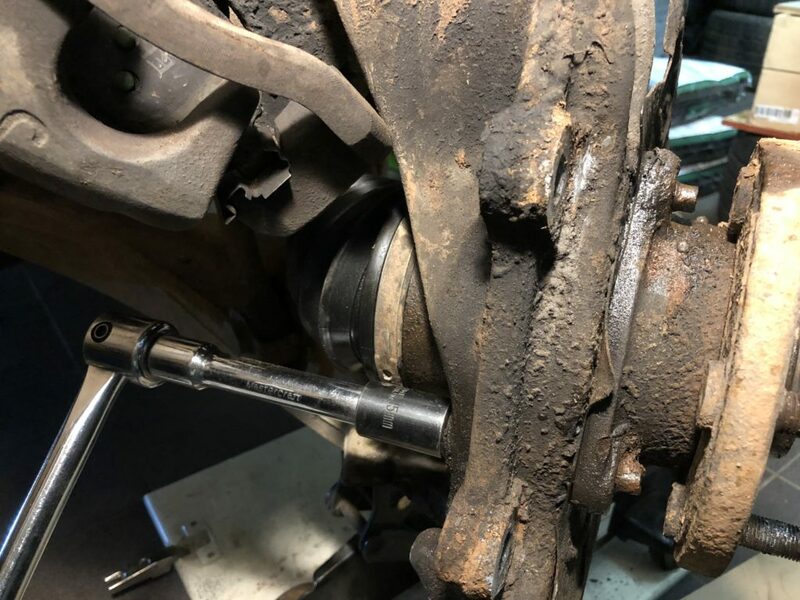 After installing and torquing the unit bearing to 85 ft-lbs and axle nut 229 ft-lbs (2006 and later) properly and putting the wheel on, the Jeep was taken for a test drive to assure the codes would clear and the problem was solved. 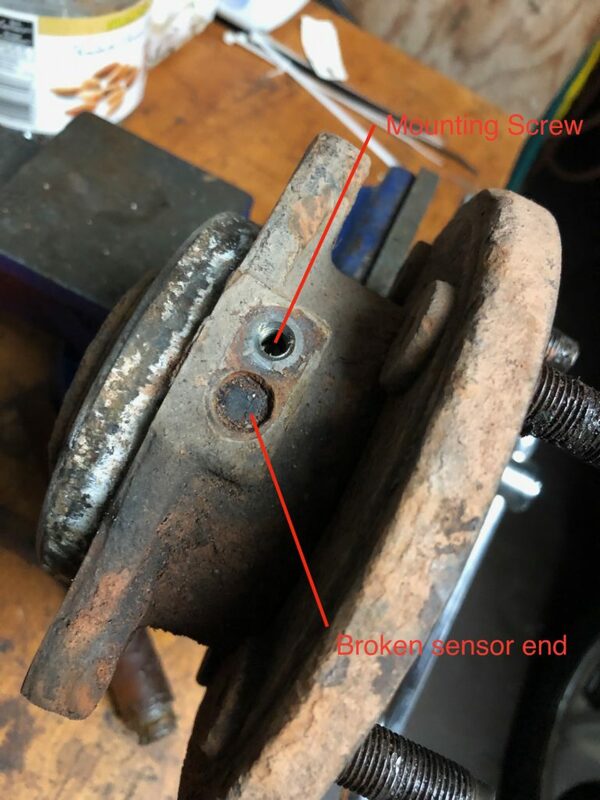 I thought I would try to pull the sensor out of the old bearing in case somebody else needed it since the bearing itself did not actually have nay issues. This was done also to see whether it would have been easy, or even possible to just swap the sensor instead of buying the whole bearing. As you can see the plastic sensor broke off in the hole in the hub. After this I tried drilling it out and seeing if I could have made a new sensor wire work. 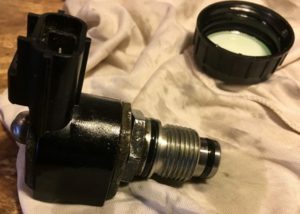 With the amount of corruption in the sensor hole I am not sure it would have worked, and it would have been more work to maybe find the new sensor would not work, plus losing $50 CAD for the sensor. 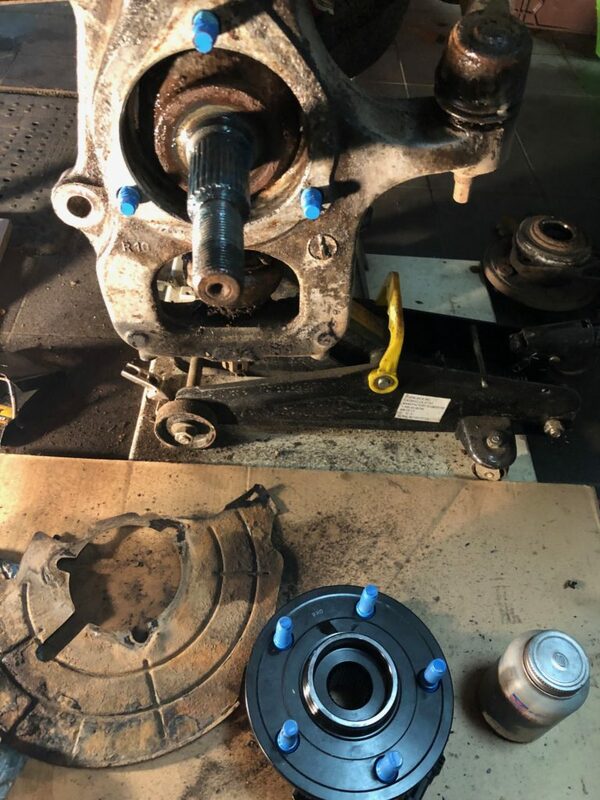 All in all I getting these bearings replaced was a preventative maintenance task that was on the list, and now that it was done, should not need to be done for the life of the truck. People have been asking me about how the Mevotech LBJs and bearings are holding up, and honestly the true test is time and miles. For now no complaints and the build quality seems exceptional. If they fail, or I have problems with sensors etc I will post it here as quickly as possible. For now all is good. Feel free to p.m. me, or write in comments if you have any questions. Every year, usually in Spring and fall, but since I run A/TW more about when i have wheels off than anything, the calliper slide pins are taken out, cleaned up on a wire whee and greased with silicone lubricant. I usually pack some extra into the rubber dust shields to make sure they are positively pressurized with grease, and then put it back together. Usually the lower bolt on the front callipers has some rust at the bell end. The last year or so I noticed the calliper slide pins were getting putted, and the rubber at the end furthest into the calliper bracket was getting deformed. 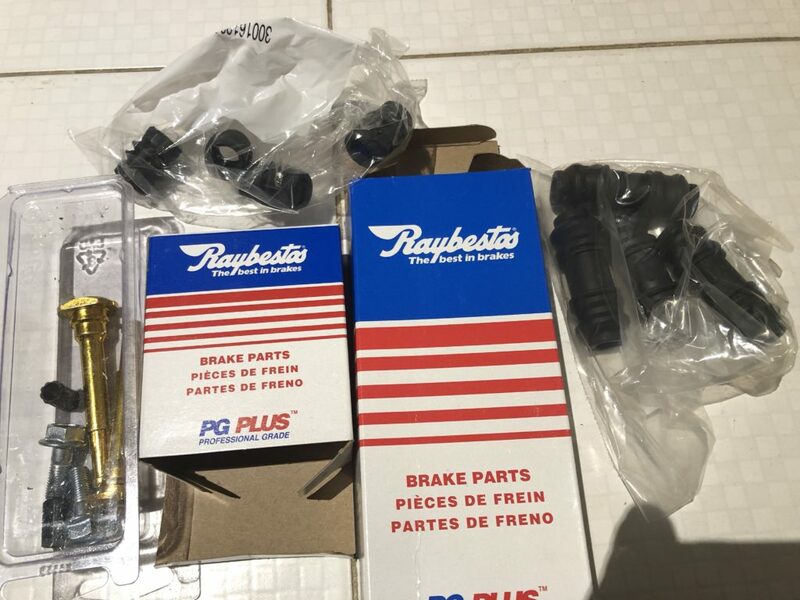 I looked to buy some replacement pins and rubbers in Canada, but the cost was close to $100 even at a trusted parts store. They only came with the pad spring clips and those were not needed. I bought the parts, and then took them back realizing that eventually I would probably swap out the callipers, and the price was not much more expensive and included all hardware. Enter Rock Auto and I was able to buy new pins and rubbers for all four corners for about $25 delivered to my door. Will be putting these on and servicing the brakes soon. Will post a few more photos of the swap and install to show condition of older pins and rubbers. Hi all. A few updates to go with Chirpz very good well explained alternator write-up. Overall you are good to go with the info here. Please do yourself a favour and order and install the alternator splash guard from Jeep. It is $8, and may save you problems down the road. 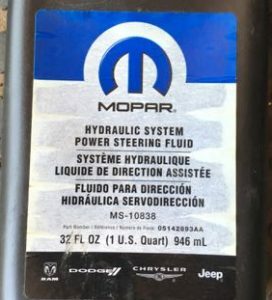 Mopar MS-10838 spec power steering fluid available from Chrysler Jeep dealers. Chrysler dealers may use the wrong fluid when servicing the vehicle, or selling you fluid. It is important you double check this. I have had a dealer tell me they had to order it by the case when I said I needed two quarts. 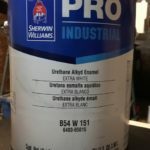 They did not want to order it to stock. I went somewhere else. Dodge Vipers used the same system for a couple years, and maybe some of the Ram trucks. It is not a widely used or understood system. 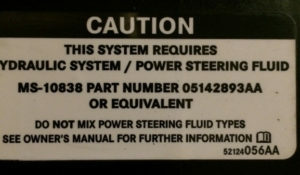 If you have a hydraulic fan insist on getting the correct Mopar MS-10838 fluid, and if your fluid is red, flush and change for correct if you have hydraulic fan. Some of the Jeep WK / WH models have hydraulic cooling fans similar to Ford Lincoln and a few other makes and models. On the Jeep the hydraulically driven fan is powered by the power steering pump and shares the same fluid as the power steering system. 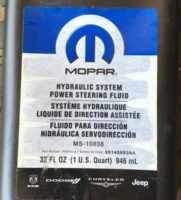 Mopar spec: MS-10838 fluid is added through the power steering fluid reservoir, and drains when your badly designed Jeep return fluid lines pop off and drain your fluid on the ground. Only use MS-10838 spec fluid or it will damage hydraulic fan. ATF+4 will not work. It may work for a short term fix, but runs risk of damaging fan unit. 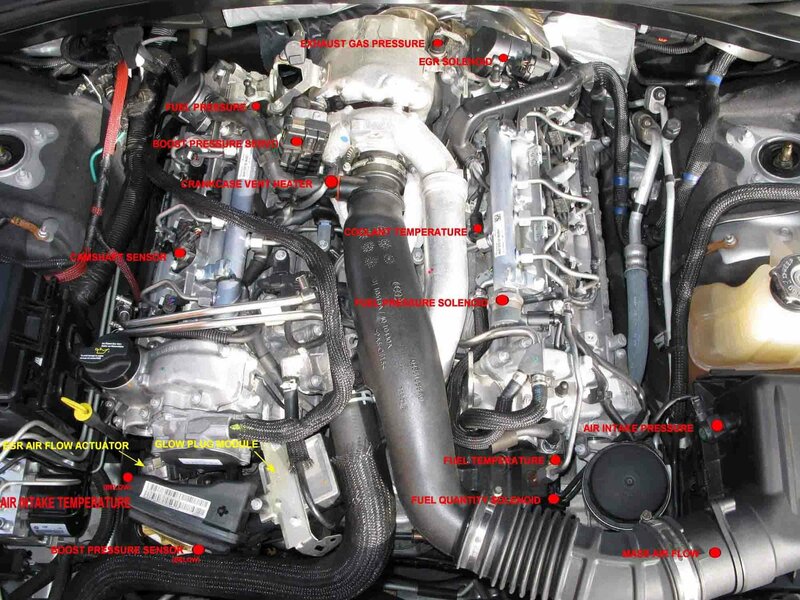 This is a very complex system controlled by the computer, and a number of different sensors including air con, transmission temp, engine temp et al. More about this can be seen in these threads. 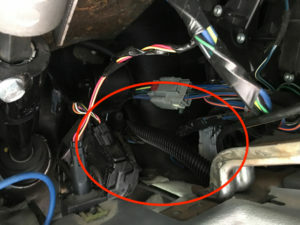 Note if you are having issues and unsure if your solenoid is bad, you can remove the thermostat wire (See image labelled below) mid center right of the motor, just under the fuel rial, and the fan should ramp up to a fairly high speed almost immediately. 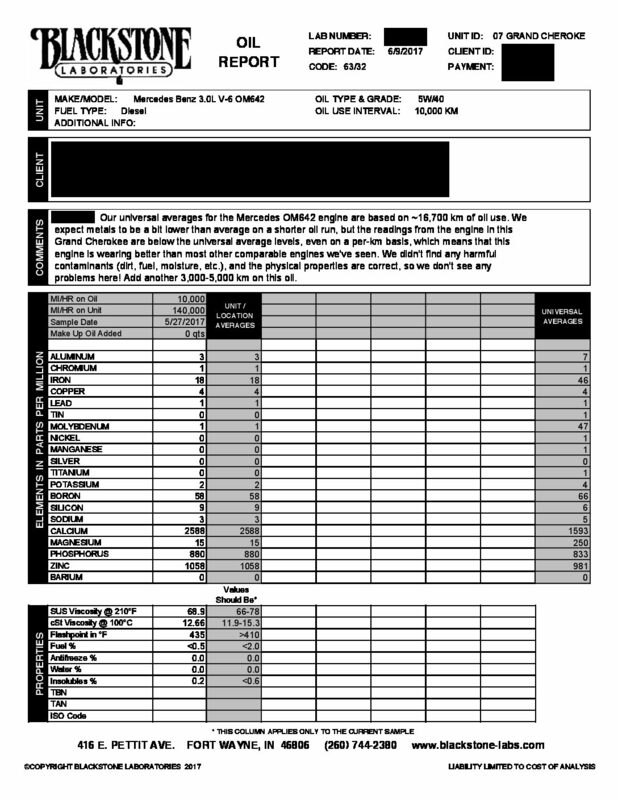 Here is a layout and sensor labelling of an OM642 CRD in a Chrysler 300. Here is a video I shot of how the fan reacts when disconnecting the wire and reattaching. This is a fairly complete thread about troubleshooting this system. It includes testing pulse width modulation signal strength with a home-made oscilloscope. 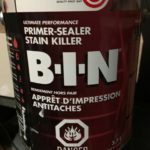 This thread is parallel, and also has a lot of good information. Above: is the three wire hydraulic fan solenoid removed. I have one for sale or loan if anybody needs one for replacement, or testing. 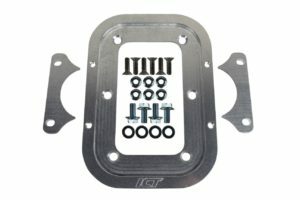 After playing with aluminum turbo pipes, silicone adapters, 90 degree beds and lots of T-clamps for over a year, am close to giving up and going back to stock. 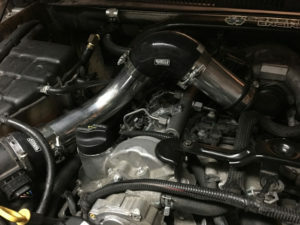 Turbo Resonator delete: I will leave all the information below, and steps etc that I took to make a T.R.D., but in the end it started blowing pipes again, and I just gave up and put the original kidney back on. I may consider buying the CB engineering Resonator delete at some point, but it is a lot of dough. Also when I pulled my resonator delete and Intercooler, and drained them there was almost no oil to be found. 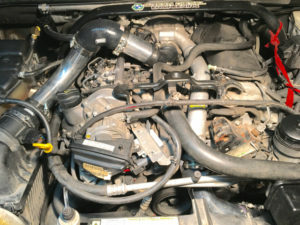 Above: See engine bay with air intake mod and oil catch can in place. 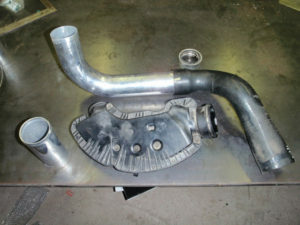 You can see the parts used here are a long aluminum 90 degree bend pipe inverted. 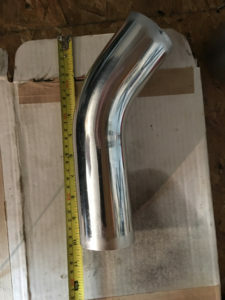 A 90 degree silicone elbow, a short length of aluminum pipe. At the air filter end there is a reducer to go from larger diameter outlet from filter box. 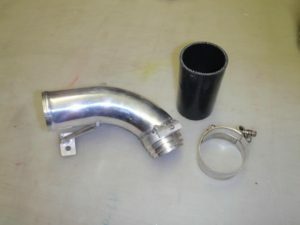 From the little straight pipe there is a 90 degree longish degree pipe (Sadly not silicone) It is smaller diameter to match the turbo intake. 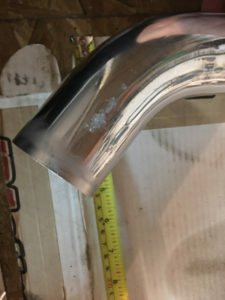 Proper stainless steel T bolt clamps for turbo pipes are a must. Vibrant makes good ones, as do others. 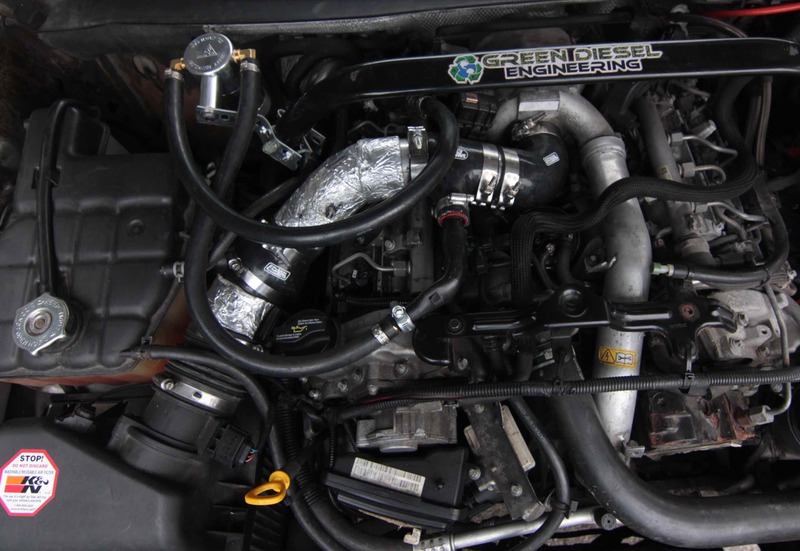 For the intake side this is less an issue since there is only vacuum and no boost. 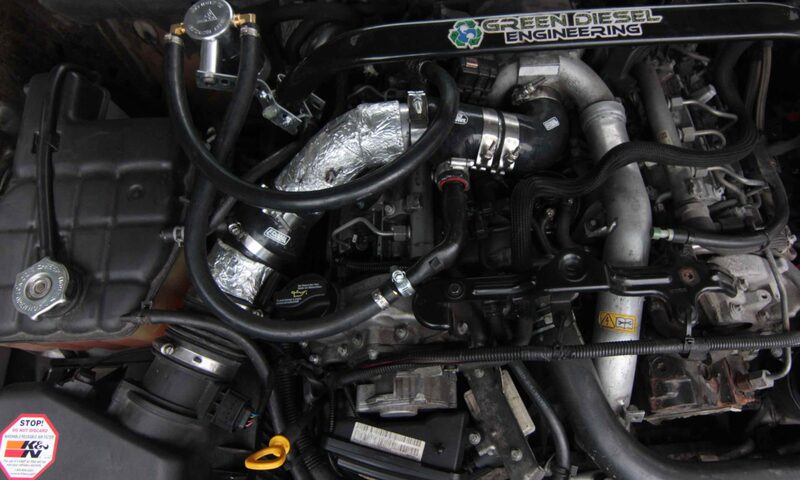 Everything below is for the Turbo resonator Delete mod. 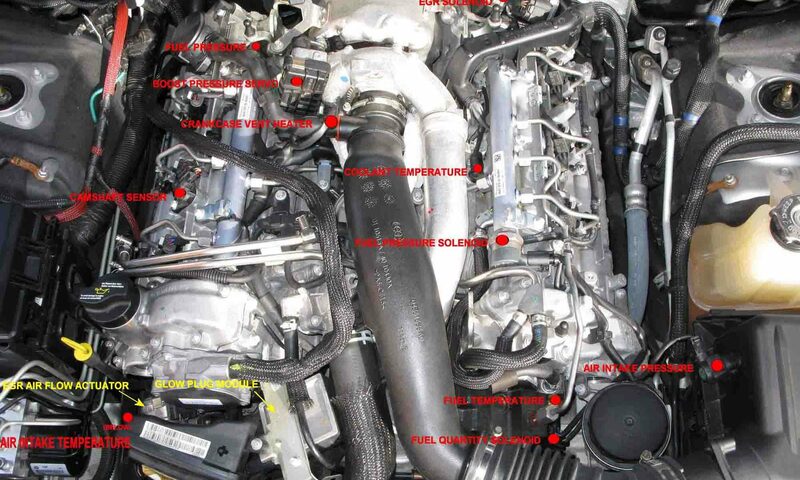 Stock “Kidney” Turbo resonator In bottom right of center you can see resonator delete pipe installed. 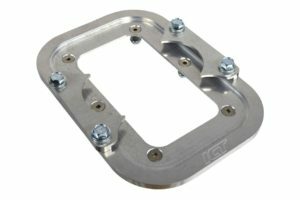 Above: This is a product you can buy online from CB Engineering. About a 33 degree bend. 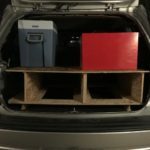 Jeep WK rear storage solution. 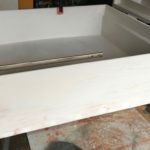 Drawer removed. Photo shows left rear corner. This is a project I have been working on for awhile, and it is 85% complete. 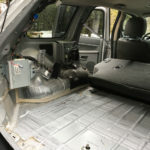 The aux battery project itself was done in combination with the rear storage project since they would need to function together as well as independently. 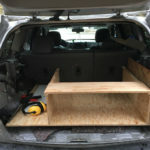 The rear sliding drawer storage system was built to be removable, and would incorporate some aspects of the rear aux. 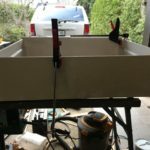 electrical system, but I needed the battery and electrical system to be totally independent of the drawers when needed, as well as be safe. 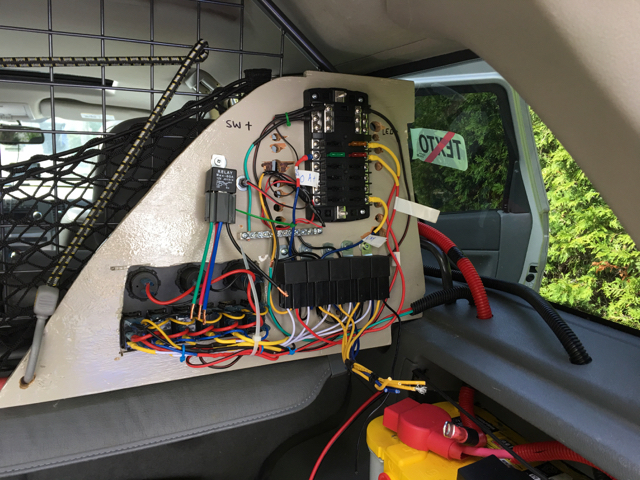 Electrical system fires are apparently one of the main sources of problems for Overland Expedition vehicles. 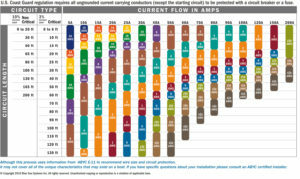 A statistic that likely does not improve with time, vibration, wear and tear. and ended up with something very different. 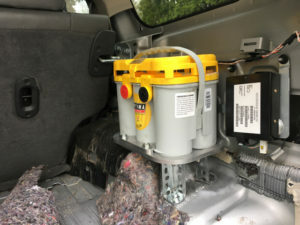 I have seen people mount their batteries on WKs in a few different places. 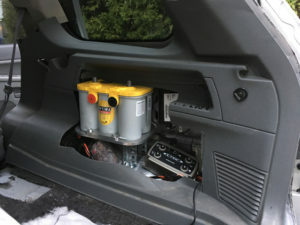 Under the hood, but that has included moving the stock electrical fuse and relay boxes. Anything that runs the risk of lowering reliability and increasing the chance of hard to troubleshoot electrical issues is not an option. 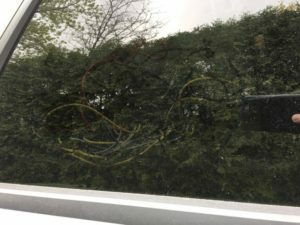 My family owned a Land Rover growing up, and I owned a 1971 MGB GT, so I am very familiar with reading electrical diagrams and tracing electrical faults, even manually simulating the alternating signal on a DC fuel pump in the back seat of said MGB to keep it going while my gf drove it home. 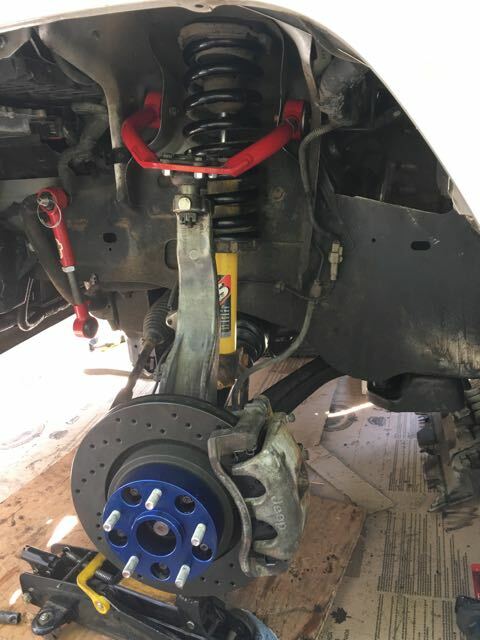 I have seen people mount them under the left hand side rear tire next to the subframe, but in the event of a rear quarter crash, or off-roading and dropping that tie off a rock this was not an option. 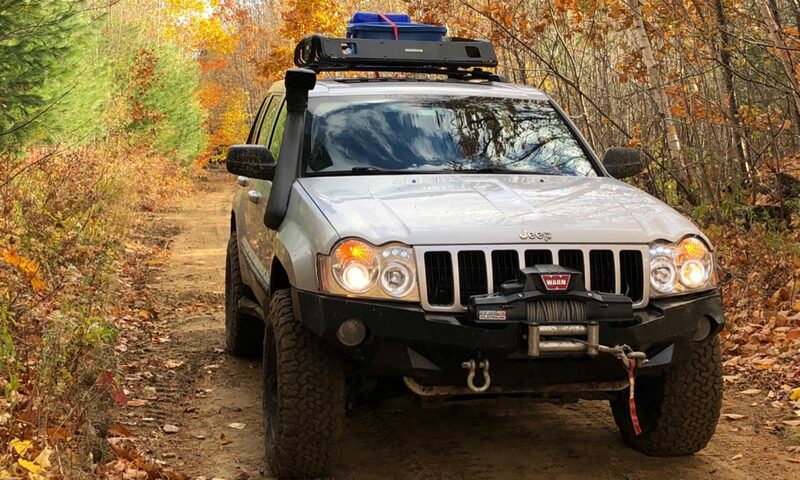 A Jeep forum member showed me where his was, and this made sense to me. When the link is dead I will kill it, and the photos will remain. I still have to add some venting, but this should not be too much of a problem with these batteries and the Ctek charging system. 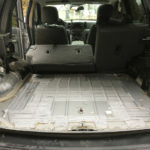 As I understand it, hydrogen gassing tends to happen more often if a battery is being overcharged. After struggling with how to mount it, I opted (no pun intended) for what was available at my local hardware store. I bought a four foot length of lightweight drilled angle steel, cut a 1 inch line on the angle, and folded the ends over, overlapping holes, drilling out as necessary and ended up with “perfectly” fitting mounting struts. 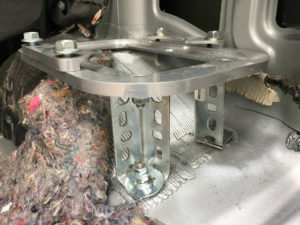 I used stainless steel bolts drilled through the fender well with the nut on the inside, and silicone seal to keep moisture and dirt on the bottom side of the wheel well. 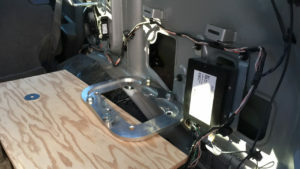 Below: By request are some additional detail photos showing how the Optima tray is mounted. 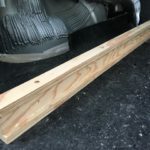 I purchased a length of slotted angle steel from my local hardware store. 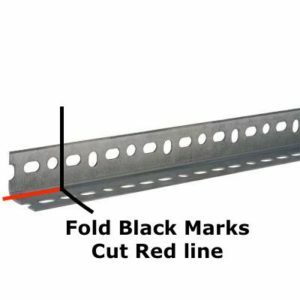 Made a cut along the angle, and folded the tabs over. Here I used double nits and lock washers to make sure nothing would vibrate loose. As you can see I only used three out of the four mounting positions for the tray. 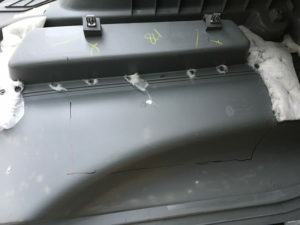 Above: Here you can see the process used to align and level the battery tray. In all honesty this seems to me to be the best tray to give battery a solid footing and take minimal space. I used a fair amount of washers as necessary to level the battery tray, and nylon lock nuts as well as lock washers as needed. Above: Attempt at making nice straight uniform lines to make an even cutout for battery poke through. Below: Semi final product. Eventually I will add some border or moulding, flashing etc to it to give it a less chainsawed look. 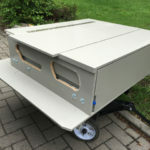 For now the fender liner functions to hold the electrical panel in place, still holds the cargo cover, and also serves as a mount for the Travall Pet Guard cargo separator. Eventually I took a half assed attempt at putting the plastic fender liner back in. It all started pretty civilized, but in the end I was hacking i tup with a sawzall in my driveway at dusk. Now that I had a battery mounted the question became how to get power to it. Currently I am not using a ground wire, but just grounding the battery to the steel unibody. Paint having been wire wheeled off, and bolted solid. Still I know this is not as good as copper, but for the charge coming through from the alternator, it should be fine. (for now). I will do some more advanced testing once the project is finalized. 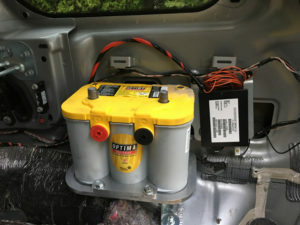 As mentioned above, I started with a basic idea for charging a second battery, but decided to get something more or less foolproof, and reliable that did not require any manual intervention, and actually charge battery more effectively and faster than the alternator and a direct line of heavy gauge wire would. It is called a “Dual” because it can also take a solar panel current direct and act as an MPPT charger. 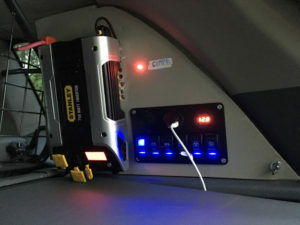 If you know anything about Solar and MPPT chargers, this Ctek box actually comes in at a pretty good price point just to be used as an MPPT, or at the very least a proper solar charge controller because most for sale on the market undercharge the battery. If you are unfamiliar with Ctek, check out a coupe episodes on Jay Leno’s garage were he explains the benefit, and how much better they are for batteries in the long or short run. 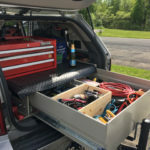 The most important tools and parts for an electrical project like this are proper terminal crimpers, proper correctly sized terminals, heat shrink, (heat gun) and research. After looking at the issues with hydraulic crimpers, and matching dies to crimpers, I opted for old school mechanical power. I must say this is one of the manliest tools I own, and I still have machetes and snake sticks left from my time living in the rain forest in Costa Rica dealing with Terciopelo aka Fer-de-Lance. (venomous snakes) Anyway, this makes crimping AWG 6 child’s play and $60 -$80 it is a bargain. Try to buy pre made battery and alternator cables and you will see this thing pays for itself very quickly. Keep in mind when buying heat shrink tube you need it big enough to cover the terminal housings, not just the wire. (Not that I made that error) Let’s just say I have a lot of extra terminal ends, and heat shrink laying about. 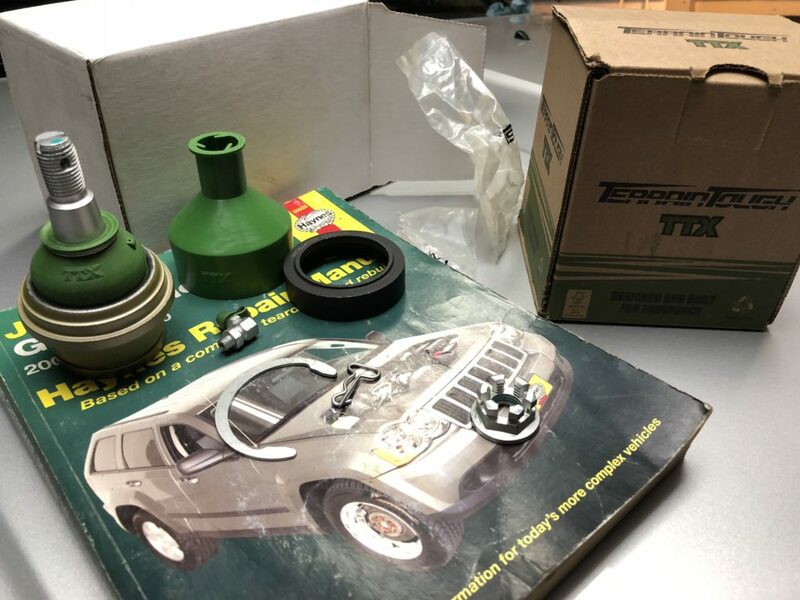 Before anybody feels the need to comment on the sloppy cutting of the inner plastic fender, and the sacrilege of cutting into sacred irreplaceable Jeep “Tupperware” I was unsure I would even put these plastic inner wheel-well liners back into place. In the ned it was a little difficult to find the lines and cut, but if anybody is considering this, please contact me and I am sure I can come up with more accurate templates o measurements to help. 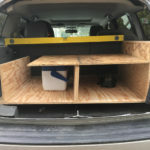 Finally I put it back because it made it all simpler to mount the wiring board, still use the cargo cover when desired, and protect the stock wiring hidden by the plastic. 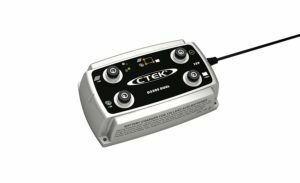 The Ctek ended up getting mounted on a piece of plywood down and out of the way. Probably important to remember, some of those steel terminals are direct to the battery, so proper insulation, or coverage is needed. Mine are normally covered by the rear storage drawer. 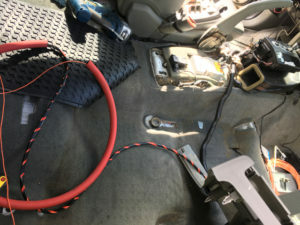 I used a backup set of 8 gauge booster cables. I don’t know if they are UV resistant, but they should not see any sun to speak of. Above: Here is wire going through firewall. I put it through large grommet on right of steering. 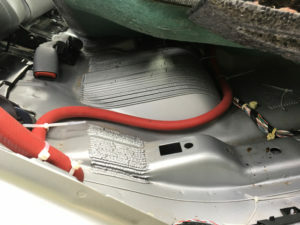 I used plastic cable protector here, and for much of the 15 foot run, but also used red rubber coolant hose under the floor carpet and rear seat. Above: There is a nice natural channel above the heating duct to run the wire to right of LHD WK driver’s legs. 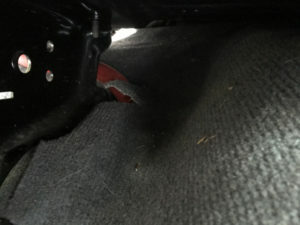 You can see the imprint on the carpet from the line of the plastic center console. Above: here you can see I taped a small low voltage wire to the side of the main charging wire. Although I did not really plan this out in advance, from experience, I know running wires while you have the chance is a good idea. 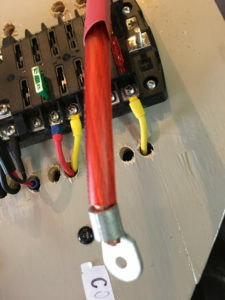 The light gauge orange wire may be used for a switch from the front panel, to a relay i the rear for pretty much anything. No idea at the moment. 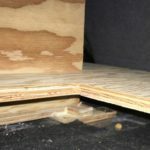 Above: Here I followed the natural curvature of the floor, and used the stock wire protection as much as possible. Here I used rubber heater hose I had laying around (Elephant hose mod) as protector. 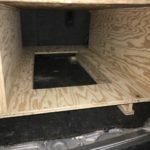 I feel the corrugated black plastic would be easier crushed and compromise the wire and insulation inside. Above: Coming up the right hand side, I used Zip ties to hold it in place. Another reason I put the stick inner wheel-well grey “tupperware” back in place. 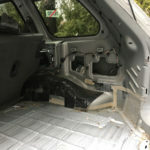 Rear seat back in place. 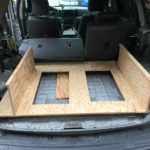 Above: Rear seat back in place. 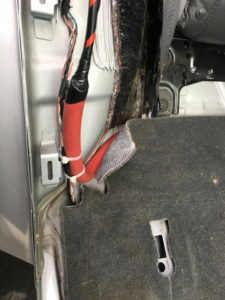 Being careful not to pinch wire with rear seat bracket. Above: Cut the carpet slightly to allow a cleaner exit for cable and insulation. 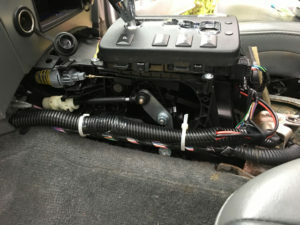 Above: Zip tied the front section, and put console back on. Left: At some point I began wiring up the fuse block. It is a Bluesea Marine panel, and has both a positive and Negative post. That means all pos and neg wires run to this panel. Here you can see an AWG 4 gauge wire with ring terminal and heat shrink waiting to be crimped and terminated. 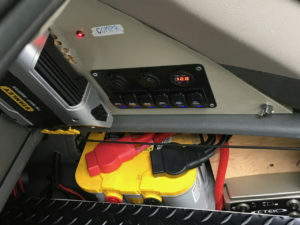 Originally I had the fuse panel on the outside for easy access, but after a bit more use, decided I needed the real estate for the Dc-AC Inverter. Originally I had holes going through from relays n the back to fuses in the front. Above: Photo is from testing, prototyping phase. Red LED I added, because I wanted to incorporate a few things that “added a cool factor” and while at the electronics store grabbed things that I felt might come in handy. In all seriousness, this is switched to the off position for the on board Air compressor relay. 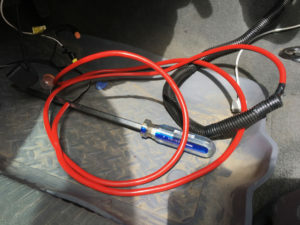 Using a 40 amp relay with a Viair 450 (or something like that I will check) allows me to leave it on all the time when a hose is attached. The light is just an extra to let me know it is off or on and is visible from the driver’s seat, which is how I positioned it in the board. Above: Relay board now looks like this. 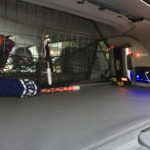 I considered moving the inverter to the other side, but for the high amperage cables needed, I figured it was best here. 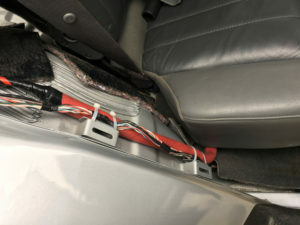 There is enough room for some air flow top and bottom, and the cable organization works perfectly this way. This is a Stanley 750 watt non-sine wave inverter. I did not do any great amount of research on this, just grabbed it on 50% off end of season sale at local hardware store for $75. I have used a rice cooker plugged in to cook rice I have plugged my RV TV in to it and it draws almost nothing, and I have plugged in my Ctek battery maintainer charger to keep the RV trailer battery topped up overnight, so essentially going Solar/alternator to DC battery via Ctek DC-DC to Dc-AC inverter to AC-DC charger to let me run DC lights etc in RV. Maybe to the least inefficient, but all part of experimenting with new system at the moment. 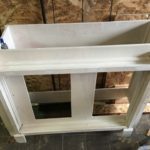 Fitting the window shaped plywood electrical board into the window opening took a few tries. 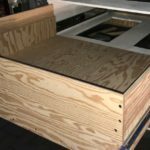 When I ordered two sheets of 1/2″ Marine Grade plywood for the drawer system, it came protected by two sheets of chipboard, which gave me a lot of material for mocking up stuff. 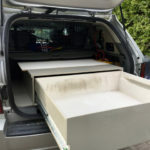 It fits into the natural contour of the plastic interior window liner, behind the Travall Pet guard. Holding it in place I drilled a hole and with large flat washers mounted a 1.5″ 5/16th bolt coming out of the plastic wall. 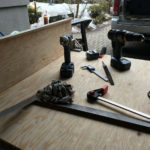 There is a hole in the plywood that slips over it, and I use a flat washer and wing nut to tighten and remove. Its not perfect, because it can be dropped easily, but works for now. For the switch panel I found a “Marine switch panel” on Amazon. 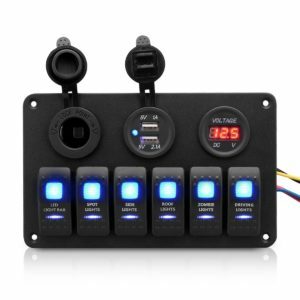 I am a little suspect, but it feels pretty good, and 6 switches, and panel plus USB, lighter socket, and dodgey Volt meter for less than $50, is hard to pass up. Considering it all comes wired up, and a pretty nice job at that, and it is a winner, at least for now. 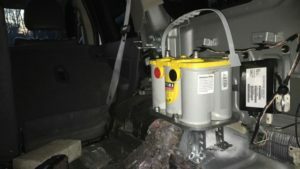 I say dodgy Volt meter because it does not give you real accurate battery level. For that you need a shunt and proper meter. I have a template fo the wooden board shape, and will be making one for the other side, as well as replacing this one eventually, maybe. Above: One word of warning I will give, and you will pick up on this pretty quickly. This is what the relay board looks like to the civilian passerby in the right/wrong light. I plan to spray tack a mesh fibre to the window to block any view inside. I have gone through US-Canada border a couple times so far, but do not want to return to my Jeep to see it surrounded by a SWAT team and demolition team trying to diffuse my refrigerator battery during these heightened times of security. N.B. I use an 80 Amp relay for the inverter. For the switch panel something else I need to adjust for security purposes is the lighting. 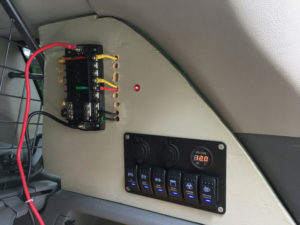 Currently I have set it up in the safest way for electrical shorts and load protection (I think), but I have no easy way of turning off LED switch lights or voltage meter while still keeping power flowing. The switch panel has three hot leads running into it all separately fused. One for LED backlights, one for Voltage Meter, USB charger plug and lighter socket, and one for something else. I will probably set up a big mechanical kill switch, but for now main power flows direct from battery to the 100 amp fuse panel. 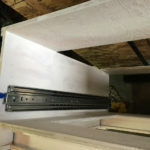 The run is so short, I am not sure it is worth the extra hassle to put in a breaker or fuse. With only 1.5-2 feet of AWG 4 cable, I am unsure what could happen that fused protection would help. Anyway, more to the point, all those pretty LED lights sure do attract passerby’s attention at night.